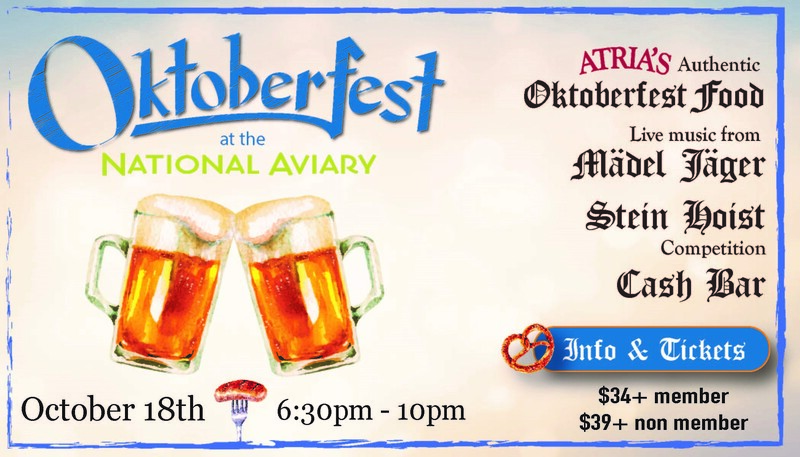 Celebrate Oktoberfest with authentic German fare prepared by chef Josef Karst of Atria's, exclusive caterer to the National Aviary. Enjoy live music by Mädel Jäger, and indulge in Oktoberfest beer and other German-Style brews from Sam Adams (available for an additional fee). You can even meet a penguin up-close, and explore The National Aviary’s immersive habitats, including the NEW Tropical Rainforest, which will be open until 9:00 pm. Atria’s Oktoberfest Chef is Josef Karst, who was born in Mittelreidenbach, that’s right, Mit-tell-ryeden-bach, Germany, in August of 1961. He graduated from Culinary School as Commis de Cuisine in 1980, and became a certified Culinary Educator in 1986 through Pope und Neumann. Throughout the 1980’s, Josef worked as Chef Saucier at Hotel Kulm in Valbella, Switzerland and later as Executive Chef at Gasthof Helmer in Schwangau, Germany. From 1989-1995 Josef was the Executive Chef and owner of Brauhaus Meisenheim in Germany and came to Atria’s in 1999 (not on a boat) where he enjoys introducing colleagues and guests to his scrumptious daily features.